Do you remember the days of Changing Rooms and other interior design programmes when their themes and ideas would be showcased using a mood board? Glued on would be photos clipped from magazines and catalogues, swatches of fabrics, notes and paint samples. Their purpose was to combine your ideas and create the ‘mood’ for the space. As lovely and tactile as they were, they were limited in terms of what you could get hold of, lacked sufficient space and didn’t really allow for changing your mind. Thankfully, times have moved on and the internet has created a new creative outlet that allows to do something similar but goes so much further. That idea gathering tool is Pinterest. Pinterest is described as online scrap booking and allows you to gather together lots of ideas. It’s not just for interior design. People use it for crafting, for baking, for artwork, for travel and pretty much anything that has a visual element. Pinterest is incredibly useful when planning an interior design project such as a new kitchen. A new kitchen represents a pretty big investment so you need to really think it through and make the right decisions. Pinterest can help you do that. It allows you to create any number of ‘boards’ which are the digital equivalents of mood boards. Any number of boards can be created for different projects or even the same project as you explore different themes. You can create public boards that anyone else can see, or private ones that are only visible to you. Once you have created your board you can start ‘pinning’, that is finding images from a number of different sources to group together on that board. You can pin images from elsewhere on Pinterest (you can search using keywords), from other websites or from your own computer, phone, camera or tablet. To show you what we mean, we’ve put together a board entitled ‘Vintage Kitchen’. 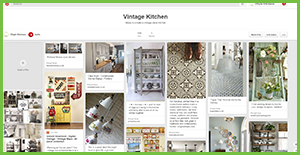 This board features lots of ideas and inspiration for creating a vintage style kitchen and features everything from kitchen units to tea and coffee canisters. You’d be surprised at how many kitchen designs hinge around a single item such as a wall tile, appliance or fabric swatch; use your board to build around this and expand upon the theme. You can see our other boards here. Once you have created your board you can also share this with your kitchen designer as it can really help them get a feel for what it is you’re trying to achieve and is much easier than trying to explain it. Click here to book a design consultation. If you’re looking for a bit more focus to start planning you could take a look at our kitchen planning guide or download our 5 top tips for choosing a kitchen. 0 Responses to "Pin your new Kitchen"